Early in 30 AD, the first Church was started when the Disciples believed and were Spirit empowered. It appears the first Church was not first Spirit empowered at Pentecost, but by Jesus in a room, 50 days before Pentecost (John 20:21-23). By the time of Pentecost, the first Church seems to have been stationed at Jerusalem. From this Church, new Churches were started, coming out of the first Church (Acts 9:31). Those that were saved were added to the local assembly, by being saved and Baptized (Acts 2:41). From Acts 15, we learn that James, the half-brother of Jesus, became the Pastor of the Church, located at Jerusalem. Why not one of the original 12, minus Judas? The answer seems to be that they were given over to spreading the gospel, not staying put in one place. They were more of the pioneer Missionaries, than of permanent Pastors. Also, the original Disciples faced certain death, shortly after the Resurrection. They were well known by the Jewish leadership, and had to keep on the move, or be put to death. In fact, James the Disciple is killed by the sword in Acts 12:1-3. These original Disciples were marked men. Early in Church history Saul of Tarsus is converted on the Damascus Road, (Acts 9) while going to kill Christians. Saul links up with the Church at Jerusalem in Acts 9:26-28, with the help of Barnabas, a disciple. Barnabas next goes to Antioch, and brings Saul to this Church. The Church at Antioch next sends Saul, to do some relief work with Barnabas, back to this poor Church at Jerusalem (Acts 11:25- 30; and Acts 12:25). Saul spent a whole year in this Church (Acts 11:26). Saul, whose name is later changed to Paul, goes on to become the greatest Missionary in Church history. Paul is sent to establish Churches under the authority of the local Church, which was at Antioch. Paul had been preaching up to this point, but could not start any Church without Church Authority. This is found in Acts 13:1-5. Man may establish all the fellowships, social groups, and “so called” Churches he wants, but only God, with His method, can establish true Churches. Throughout the first century, the Churches spread, the more they were persecuted. Paul, the greatest Missionary, started Gentile Churches, which led to the Gospel going into the entire World. Early in Church history, man tried to pervert the gospel (Galatians 1:6-9). Man tried to teach works Salvation. (Ebionism) See also Acts 15:1-5,11. This is the problem even today, of those who teach you can lose your salvation. They are teaching works salvation! Later on, Gnosticism became a problem in the first Century Church (1 John 4:1-3). This false teaching, denied the humanity of Christ. This was the heresy that Menno Simmons was caught up in. The Bible calls him an Antichrist! Another Heresy of the first Century was the doctrine of the Nicolaitanes (Revelation 2:6,15). It appears this group taught a hierarchy for the Churches, leading to Roman Catholic False Church. The Nicolaitanes were also a licentious sect. Another heresy was Balaamism. This was a merger of paganism and Christianity. See Revelation 2:20. This can even be seen today in fundamental Churches, that have been influenced by the Willo Creek Movement or (Purpose driven Church movement). Also, shortly after John finished the book of Revelation, (the end of the first Century) another Heresy came into the Churches. This was the belief of Baptismal Regeneration. Remission of sins became through the tub, not the blood. This was works Salvation all over again. Men who taught this heresy in the first few hundred years, were, Hermes, Barnabas, (not the N.T.one), Justin Martyr, Origen, Tertullian, Irenaeus, Cyprian, Hilary, Basil, Cyril, Gregory, and the famous Augustine. This heresy began the start of the pulling out of the true Churches. As Churches became Worldlier, and more false doctrine came in, more and more Churches withdrew fellowship from other Churches. The true Churches were called Anabaptist (Rebaptizer) Churches. They Baptized again, any person coming from a questionable group. They baptized again, any person Baptized before they were saved, or any person not properly baptized. This led to much hostility by the non-Anabaptist Churches. The Byzantine Emperor, Justinian I (529AD- 565AD), condemned anyone practicing AnaBaptism to death. This was by the Justinian Imperial Law Code of 529AD. This was used on the AnaBaptist throughout the dark ages. In 1529AD the Imperial Mandate reinforced this Law. This led to the death of thousands of AnaBaptist during the Reformation period. Also in the first Century was a group known as the Welch Baptist. They were also called AnaBaptist by themselves. The Welch Baptist started in 63AD. They were known as Mountain Baptist. All who joined the Welch Baptist were Baptized by Immersion again. They believe in no authority but the Bible, and the Lord’s Supper was symbolic only. See- Ford, pages 32-34. The Welch Baptist came to America to start Baptist Churches in the 1600 and 1700 hundreds. In 1663 AD – John Miles came from Wales to Swansea, Mass. In 1692AD – John Phillips a Welch Baptist came to America. In 1701AD - Thomas Griffith, a Welch Baptist Minister came to America with 15 members of his Church with him. In 1713AD – Thomas Davis, a Welch Baptist Minister came to America. In 1727AD- Richard Jones, a Welch Baptist Minister arrived in America. In 1739AD – David Evans, a Welch Baptist Minister came to America. In 1761AD – Morgan Edwards a Welch Baptist Minister arrived in America. See – Jarrel, pages 398-399. What then is the History of the Welch Baptist? According to Davis, in History of the Welch Baptist, page 7 -- Prudence & his wife Claudia, were saved under the Apostle Paul in Rome in 63AD. Shortly thereafter, they returned home to Wales, with many others who had been saved. In the year 180AD, two ministers by the names of Faganus and Damicanus, who were born in Wales, but were born again in Rome, and there becoming eminent ministers of the gospel, were sent from Rome, to assist their brethren in Wales. See- D.N. Jackson, (Why I Am A Baptist), page 11. In this same year, Lucius the Welch King, became the first King in the World to embrace Christ, and he was baptized. About the year 300AD, the Welch Baptist suffered most terribly and bloody under persecution. This was the 10th pagan persecution under the reign of Dioclesian. Again, after 600AD, the Welch Baptist suffered greatly, when Austin came from Rome to convert the people to Popery. Austin, having succeeded in England, was not successful in Wales. The reason being, that the Welch were strong Christians who believed in a separation of Church and State all together. They believed that the Kingdom of Christ is not of this world. However, the Welch ministers and delegates agreed to meet with Austin. When the Welch would not submit to infant Baptism and Popery, Austin had the Saxons murder all the Welch Ministers and delegates. Many more afterwards, were put to death. With the leading men being dead, King Cadwalader and the majority of the Welch people submitted to popery, out of fear. The remaining true AnaBaptist fled to the mountains (Mountain Baptist). According to Thomas’s History, by 1653AD, there was only six or seven true Baptist Churches left, all in the mountains. See-History of the Welch Baptist, by Davis pages 1-20. A very famous Welch Baptist in the 15th Century was a man named William Tyndale. This brings us back to the second Century, in AnaBaptist history. In the Second Century, shortly after the completion of the Bible, a group of God’s true Churches were called Montanist. They disapproved of infant Baptism, defended non-resistance, and taught strongly the prayer veil. (See Mennonites in Europe, page 3). Tertullian, a second Century writer, became a Montanist. NOTE- He would have had to reject his earlier teaching of Baptismal Regeneration to become a Montanist! See - Tertullian, page 109. Also, in the Second Century through the Reformation, was a group known As the Waldenses. They were also called AnaBaptist because of their teachings on Baptism. They believed a person needed to be saved first, than have Baptism by Immersion only, placing them into a true church, the church only being local. This group separated themselves not only from latter Rome, but other Religious groups –Clover, page 324. The name Waldense, came from Peter Waldo, a rich merchant of the 12th Century. However, he was not the founder of this group. According to the Bishop of Meaux, the Churches of this Movement began in 120 AD. (See Ecclesiastical History of the Ancient Churches of Piedmont, by Allex, pages 191-193). The Waldenses taught non-resistance, no lawsuits, no oaths, no attendance at worldly amusements, and against the worship of relics and purgatory. Their ministers were not salaried, but were well supported by the membership. (See – Mennonites in Europe, pages 5 & 6). Just why did groups separate from the majority of Churches? The answer lies in even more Heresy that was coming into the Churches. Around 150AD – Some Churches started practicing open Communion. That is, no checking on whether a person was saved and Baptise or not, just opened to anyone! Another heresy was Sacradotalism. This put God’s people into 2 classes, the laity and Clergy class. “Thou shalt not make unto thee any graven image, or any likeness of any thing that is in heaven above, or that is in the earth beneath, or that is in the water under the earth”. The problem was that, man began to make images to teach truth. This led to praying to idols, and holding images as tokens of religion. It became necessary to have symbols in order to worship. Even today, how many “religious symbols” are in the average Baptist Church? This is a carry over of Sophistication. In the second Century Tetullian (160-230AD) even defended Christians against accusations of “Cross Worship”. How many Baptist Churches today have a cross, a fish symbol, a Catholic Steeple, flags, and Catholic pictures of Saints and a Hippy Jesus! “Toward the conclusion of the second century, one Montanus, who lived in a Phrygian village called Pepuza, undertook a mission to restore Christianity to its native simplicity. One class of professors being at the period carried away with Egyptian symbols, while others made up a system of religion from philosophic notions, oriental customs, and a portion of the gospel; apparently prompted this humble individual to attempt a reformation, or rather a restoration, of the primitive order of things. Being destitute of classical lore himself, he required it not in others who were willing to further his designs. He was decidedly hostile to those ministers, who with the new system, emanated from Alexandria”. – See Orchard, pages 117-118. Another heresy in the second Century was Sacramentalism. This heresy began to change the Scriptural balance between the substance and the symbol. In the 3rd Century there was a group known as the Novatians. They were also called AnaBaptist. – See Moshem, Institutes of Ecclesiastical History, Volume 1, page 203. These Novatians claimed they were the only true Church. They recognized no authority but theirs. – Vedder, page 64. The Novatians were strong in their belief in Repentance, for Salvation. They believe a true Church must be pure and holy. They believe in Immersion only after Salvation. – Ford, page 88. The Novatians continued up until the Reformation and the rise of the AnaBaptist Movement. See- A History of the Baptist, by John Christian, page 44. The Novatians would not let back into membership those who had denied Christ during persecution. It was during the 3rd Century that a Church Higharchy came into being around 251AD. Another heresy of this time was Modalistic Manarchianism- Patripassianism/Sabellianism. This was the heresy that denied the trinity. This heresy taught the Godhead as three modes of the same person. It denied 3 persons in one substance. It is still believed today by the Apostolic Church cult. Another heresy practice in a form today by Mormons and jehovah witnesses was Subordinationism. This heresy (advocated by Origen) taught Christ was a god, not the God. It went on to say that the Son created the Holy Spirit. See – Schaff, History of the Christian Church, VOL III, page 254. In the 4th Century through the 6th Century was a group known as the Donatists. These were also called AnaBaptist. See- Christian, page 45 & Jarrel, Baptist Church Perpetuity or History, page ix. They Rebaptized by Immersion those who had been Baptized as infants. See- Ford, page 80. The Donatist believed in strong Church Discipline- Secret Sinners but not open offenders, See Jarrel, pages 92-93. They were strongly against a blending of Church and State. The emperor tried to loan them money, but they sent it back as against the union of Church and State. See –Jarrel, page 103. “Under the ancient Roman law against Rebaptizers (Donatists) those called AnaBaptist could be suppressed by the sword”. See- The AnaBaptist view of the Church, by Frank Littell, page XV, 1958, published now by Rod & Staff. One great heresy of this period was Arianism. This heresy taught that Christ was the greatest created being – a god. It would be wrong to leave out the greatest heresy of this period—Roman Catholicism. In 313AD, the Emperor of Rome Constantine 1st, declared Christianity (Roman Catholicism) the State Religion (The edit of Milan). This combined the Church and State, and brought all religious group into Catholicism or perish. Suddenly, pagan idols got Christian names, and paganism continued, even today, in the great Catholic Whore! It should also be noted that Catholicism practiced, and still does practice water baptism, for washing away of sins. This led to aspersion (pouring of water), because it was easy to do. Another heresy of the 4th Century was Apollinarianism. This heresy stated Jesus was 2/3 human and 1/3 Divine. In the 7th Century through the 10th Century was a group called the Paulicians (Thonraks and later Bogomils). These were also called AnaBaptist. They believed Baptism alone placed you into the local Church, after having been saved by a Repentant Faith. In the 9th Century the Paulicians drove the Byzantine government out of Armenia and established the free state of Teprice. The Church was completely separate from the state and freedom of conscience was granted to all. For 150 years this government existed. It may be the first government ever which gave written guarantee of religious freedom to its citizens. The Paulicians were called Baptist or Sabians (Arab word for ReBaptizers). However, it should be noted all other AnaBaptist were non-resistant. In the 11th Century was a group known as the Albigenses. The Albigenses believed in only a local Church. They believed in Baptism by Immersion for the saved only, See- Ford, page 51. They practiced only Closed Communion. See – Jarrel, page 168. This group is given as an example, of differences in the body of Christ, always. Please never think you have all truth, because you don't! In the 12th Century was a group known as the Petrobrussians. They believed in Immersion of true believers only. They believed the local Church was a body composed of regenerated persons. See- Ford, page 54. In the 14th Century was a group known as the Lollards. They believed in Christian Baptism by Immersion. They stated a local Church was an assembly of Baptized believers. In the 1500’s, was the Protestant Reformation. At this time, religious leaders withdrew from Roman Catholicism. In Switzerland was a man named Zwingli. He headed the state run Protestant Church there. However, certain followers of his began to study the Scriptures for themselves, and decided that Zwingli had not gone far enough out of Catholicism. Zwingli’s main thorn in the flesh was Conrad Grebel. Grebel became the leader of what became known as the Swiss Brethren. He was born in 1522, but born again in 1522. A close friend of Grebel was Felix Manz. He was born in 1490, and along with Grebel gave Zwingli much trouble. It is interesting to note that Zwingli planned on these men teaching at the theological school planned for Zurich. That is before they became AnaBaptist in the 1520’s. Another great leader at this time was George Cajakob (Blaurock). He had left the Catholic Church as a monk in 1524, and had first gone to study under Zwingli. However, he left Zwingli, and joined up with Grebel and Manz. Another person who joined the group was Andrew Castelbeger. Another person who joined the group was Wilhelm Reublin. His story is a sad one, for he was one that was among the group, but never one of them (Religious, but lost). Reublin had been a Catholic Priest who because of his preaching, was banished in 1522, and went to Zurich and married. He was a strong believer in resistance by force to build a Church. He tried successfully to get the Peasants to rise up by force against all establishments. The Peasants did revolt against the establishments, but lost, with many lives lost. When AnaBaptist were becoming Martyrs, Reublin went back into Catholicism, for the rest of his life! Another leader among the Swiss Brethren was Balthasar Hubmaier. He also believed in the use of force to create a new church. However, after being a prisoner in Zurich, and seeing that he could end up dead, he too went back into Catholicism. (See M.I. E., page 160). The split between Zwingli and the Swiss Brethren took place for good on January 17th, 1525; this was after having public debates. Zwingli gave no room for differences in his new Protestant state Church. (M.I.E., page 50 and 51). In March 1526, Grebel, Manz, Blaurock, and Hubmaier were all arrested and were prisoners in Zurich. The same day sentenced was pronounced on them, the council of Zurich decreed, “that anyone who would henceforth perform the act of Rebaptism should be drowned without mercy – without trial or further hearing”. (See M.I. E., page 55). Much has been said by the Mennonites and others, that the first Baptism by Grebel was by pouring. This was even shown in a film, put out by the Mennonites. Thus according to the Mennonites, AnaBaptist Baptism was by pouring, not by Immersion. However, Grebel who in 1525 (probably late January), did Baptize by pouring, just one month latter, (February 1525) rebaptized Wolfgang Uliman by immersion in the Rhine, who he had Baptized by pouring, just one month earlier. From than on, he only immersed. What happened during that month, we do not know? However, based on Grebel’s actions, it is safe to say, he experienced Biblical Baptism by a true AnaBaptist. He corrected the bad Baptism, and made it right! This issue was so big, that just one month later, March 1526, the Zurich counsel ordered the killing of all AnaBaptist by drowning! See Church Perpetuity by Jarrel, pages 196-206, also Kessler in his Sabbata, Vol I, page 266. On Oct 30th, 1526 Grebel was executed by beheading by Zwingli. On January 5th, 1527, just 3 months latter, Felix Manz was executed by drowning by Zwingli. Another great leader, during this brief period was Michael Sattler. He had left the Catholic Church as a friar, and married a Nun. He became for a while, the guiding force of the Swiss Brethren. In February 1527, he presided over a conference of Swiss Brethren, which produced the Swiss Confession of Faith, called the Schleitheim Confession, on February 17th, 1527. (See M.I. E., page 72-73). Baptism shall be administered to all who have been instructed and give evidence of repentance and a change of life, and who believe of a truth that their sins have been taken away by Christ, and who desire to walk in the resurrection of Jesus Christ and to be buried with Him into death, that they may also rise with Him, and to all who desire baptism of us by their own decision with this understanding. Discipline and expulsion shall be used toward those who have surrendered their lives to the Lord to follow Him in keeping His commandments, who have been baptized and profess to be brethren and sisters, and yet stumble and fall into sin or are unexpectedly overtaken. They shall be admonished twice and the third time reproved publicly before the church and expelled according to the command of Christ, Matthew 18. And this is to be attended to before the communion service that we may unitedly and in one love break and eat of one bread and drink of one cup. All who partake of one bread in remembrance of the broken body, and of one cup in remembrance of His shed blood, shall be those who have been united by baptism into the one body, of which Christ is the Head. “Ye shall not resist evil”. Ministers shall have the qualifications mentioned by Paul. They shall teach and exhort and assist all the members toward advancement in their spiritual life. When a minister needs material support, he shall be aided by the congregation. If he be driven away, or imprisoned, or suffer martyrdom, another shall at once be put in his place. The civil government is an institution of God outside the perfection of Christ, to punish evildoers and protect the good. In the Church of Christ no other means of correction are used than discipline through admonition and expulsion of him who has sinned. The question is asked; can a Christian become an earthly ruler if he is elected to such an office? The answer is: Christ was to be made a king, and He fled (John 6:15). We should do likewise and follow Him, and we shall then not walk in darkness. He forbids the use of violence, and says (Matt. 20:25): “The princes of the Gentiles exercise dominion, etc., but it shall not be so among you.” Again Paul says (Rom. 8:29) that the believers are predestinated to be conformed to the image of His Son, and Peter wrote (I Peter 2:21) that Christ has suffered, not reigned, leaving us an example that we should follow His steps. 7. Christ, the perfect Teacher, forbade His disciples all oaths, whether true or false. Michael Sattler was executed by being burned at the stake on May 21st 1527, for being an AnaBaptist. Much has been said about the fact that the Schleitheim Confession was against the use of force. The quotes to follow are very important in any discussion on this issue. In 1688, the Council of War proposed requiring all men and boys to carry a weapon. This was so they could find out who were the AnaBaptist, for they would never carry a weapon, being non-resistant. In 1693, all men were ordered to swear an oath of Allegiance. This was done to find out who were the AnaBaptist, also called the Taufer’s. This was because the AnaBaptist would never swear an Oath of Allegiance. John Clark organized the first Baptist Church in America in 1638, at Newport, Rhode Island. See- D.N. Jackson, page 12, Why I am a Baptist. The first Baptist Church in America was not started by Roger Williams, and back dating the starting of a Church, to try to claim to be the oldest, will still not change the facts! Sir Issac Newton declared, “The Baptist are the only body of known Christians that never symbolized with Rome”. Due to the fact that the Mennonites pour in Baptism, and practice a works salvation, it is hard to see, how they claim, that they never symbolized with Rome. Menno’s Catholic doctrines clearly comes out in the Mennonite Church. Cardinal Hosius, a Roman Catholic declared in 1524, “Were it not that the Baptist have been grievously tormented and cut off with the knife during the past twelve hundred years, they would swarm in greater number than all of the Reformers”. Bullinger, a distinguished Protestant historian, in the year 1540, declared, “The AnaBaptists think themselves to be the only true Church of Christ, and acceptable to God; and teach that they who by baptism are received into their churches ought not to have any communion (fellowship) with those called evangelical, or any other, whatsoever for that our (evangelical, protestant, or reformed, etc.) churches are not True churches any more than the churches of the Papists”. J.L. Reynolds, Professor at the University of South Carolina in 1843, declared, “The conclusion is irresistible, that they (The AnaBaptist) did not consider even immersion valid when it was the act of an unimmersed administrator, and that there could be no valid baptism, unless the administrator was authorized to Baptize by a Properly Constituted Church”. Mosheim, a Lutheran historian declared, “Before the rise of Luther and Calvin, there lay secreted in almost all the countries of Europe persons who adhered tenaciously to the principles of modern Dutch Baptist”. The Edinburgh Cyclopedia, a Presbyterian work, declared, “It must have already occurred to our readers that the Baptist are the same sect of Christians that were formerly described as AnaBaptist. Indeed this seems to have been their leading principle from the time of Tertullian to the present time”. It should be noted that, Tertullian was born just 50 years after the death of the Apostle John. Doctors Ypeij and Dermont, who were both Dutch Reform, declared, “We have already seen that the Baptist – those who in former times were named AnaBaptist, ….. were the original Waldenses, the men who in the history of the church, in time so far back, have obtained a well - deserved renown. In consequence, the Baptist may be regarded as being from of old the only religious denomination that have continued from the times of the Apostles, as a Christian society who have kept the evangelical faith pure through all the ages hitherto”. In secular and protestant “church history, however, the name of AnaBaptist is generally applied to a class of fanatical men who, at the beginning of the Reformation in the sixteenth century, raised violent disturbances in the center of Europe, and brought upon themselves a lasting odium. These religious-political fanatics were at the time confounded with the Baptist, from whom, however, they widely differed. The fanatical Anabaptists, of whom we are now to speak, were originally from Germany, where under the bishopric of Spiers, they, by a rebellion, had made known their displeasure at the oppressions of the so-called feudal system. This happened in the year 1491. Since, that time, they, by their revolts, had often caused anxiety, and given the Government no little trouble. This continued until the time of the Reformation, when these rebels sought in the new religion an augmented power, and made the most shameful misuse of it to the promotion of their harassing disturbances. These ought by no means to be considered the same as the Baptist. The Baptist are Christians, entirely different from the Anabaptist (fanatical ones) in character. They were descended from the ancient Waldenses, whose teachings were evangelical and tolerably pure, and who were scattered by persecutions in various lands, and long before the time of the Reformation of (Catholicism), were existing in the Netherlands. In their flight, they came hither. In this country and in Flanders, in Holland and Zealand, they lived as quiet inhabitants, not intermeddling with the affairs of church and State: in the villages tilling the land, and in the cities, working at some trade, or engaged in traffic, by which means each one was well supplied, and in no respect burdensome to society. Their manner of life was simple and exemplary. No great crime was known among them. Their religious teaching was simple and pure, and was exemplified in their daily conduct. In the sight of the authorities they lived as peaceful citizens, obedient, and noted for their uprightness, honesty, conscientiousness, temperance, and godliness”. See -- Clover’s, Baptist History, pages 330 & 331. “After the reformation, it became necessary for the Lord’s Churches to adopt a name in order to distinguish themselves from the Protestants. They simply discarded the prefix Ana, and called themselves Baptist”, -- Clover’s Baptist History, page 332. Some have claimed that they did this to avoid further persecution. If this was the case, it did not work well! “Not all those designated AnaBaptist were true Baptists. However, on the other hand, all the true churches were at one time or another called AnaBaptist”. See Clover’s Baptist History, page 332. Maybe it is time for the True Churches to once again, return to their historic name of AnaBaptist! In the 1700 and 1800’s the Baptist Churches grew in America in part, due to the activities of the Philadelphia Baptist Association. In 1845, the Southern Baptist formed the Southern Baptist Convention, due to the issue of Slavery. The first great Awakening (1734-1750) also helped in the growth of Baptist in the United States. The Second Great Awakening took place in 1790-1802. By 1850, it was estimated that one out of every eleven people in America identified themselves as Baptist. Revival continued on in the last half of the 1800’s in America, with men like Moody, and Spurgeon in England. In 1924, the American Baptist Association was formed. It took a strong stand against Protestantism. The General Association of Regular Baptist Churches formed in 1932, not as a Convention, but as a Fellowship. The World Baptist Fellowship (originally the Premillennial Baptist Missionary Fellowship) was formed in 1933, under the leadership of J. Frank Norris. The Southwide Baptist Fellowship was started in the last half of the 20th Century under the leadership of Lee Robinson. The Baptist Missionary Association was started in 1950 as a split from the American Baptist Association. In the early 1980’s, Greg Dixon started the Unregistered Baptist Fellowship, which within 20 years deteriorated, when the Fellowship saw Government as the enemy, instead of the World, the flesh and the Devil. Finally, the Baptist Bible Fellowship was started in 1950, as a split from the World Baptist Fellowship. See—(History of the Baptist, by Lehigh Valley Baptist Church, 4702 Colebrook Av., Emmaus, Pa 18049). This is an excellent book, one in which all Christians should purchase! What has been the results of all these Conventions, Fellowships, and Associations? – Compromise, and Ecumenicalism. With Baptist leaders like the late, Jerry Fawell, no longer Doctrinally sound, (if he ever was) and old sound Preachers of the Faith, dying off, maybe this is the last generation, before Jesus returns! One of the worst things to destroy Baptist has been easy beliefism, and it is getting stronger year by year. Jack Hyles until his death was one of the worst to promote easy beliefism. One glimmer of hope is the Unaffiliated Baptist Fellowship, promoted by E. L. Bynum, of Lubbock Texas, and Ron Tottingham of Sioux Falls, SD. However, Pastor Bynum doesn’t have many more years, and brother Tottingham’s background is very patriotic, a long way from the position of Heaven being are citizenship by the AnaBaptist. Brother Tottingham does have a Bible College for training Pastor’s, and for now, it seems to be producing! But after these, what? Sammy Allan of Georgia still has his camp meetings three times a year, to bring Baptist together. However, he is now calling his camp meetings a Church, very patriotic, and AnaBaptist distinctions, are fading away. God still does have His true Churches out there; it is just getting harder to find them! Did the AnaBaptist sprinkle or practice Immersion? According to Christian in, “A History of the Baptist”, page 194, it states, “Immersion was the universal rule of Baptism in the reign of Henry 8th (1533- Immersed). Erasmus, writing from England in 1532, gives the English practice. He says: “We dip children all over in cold water, in a stone font”. Every English monarch of the sixteenth century was immersed”. The Sum of the Holy Scripture, an Old Dutch book, demanded the Immersion of the believer and denied infant Baptism. It was printed in England in 1529. Fuller, born in 1609, in his Church history declares that the Dutch Baptist were dippers for Baptism. Daniel Feastly, an opponent of the Baptist, born in 1582, also declares that the Baptist of the reign of Henry 8th practiced dipping. Christian in his book, the History of Baptist, also declares on page 196, “The Church of England, the Baptist and the Catholic’s all practiced immersion during the 16th Century. Martin Luther’s Sermon on Baptism, Volume 10, pages 2513 and 2593, refers to the AnaBaptist as a, “fanatical sect of reformers who contended that Baptism should be administrated to adults only, not by sprinkling, but by dipping”. Jarrel, on page 196 in, Baptist Church Perpetuity, states, “Nothing satisfied AnaBaptist, but the Immersion of a professed believer”, in reference to Baptism. His words became a proverb. Zwingli called AnaBaptist, “Bath fellows”. 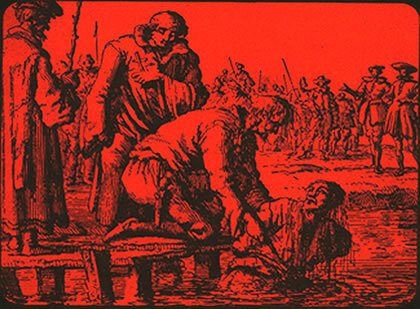 Within the Canton of Zurich, the usual punishment for AnaBaptist, was drowning. Felix Mantz, an early leader of the AnaBaptist in Zurich, suffered death by drowning, in the lake of Zurich, near Zwingli’s church. Kessler in his Sabbata, volume 1, page 266, declares that Wolfang Uliman of St. Gall, went to Schaffhausen and met Conrad Grebel, an AnaBaptist Scholar, who instructed Uliman in the knowledge of Baptism. That Baptism was not sprinkled out of a dish, but was drawn under and covered over with water. Conrad Grebel then Baptized Uliman in the Rhine River. The historian Wagenseil, in 1527 stated, that Baptism was by being wholly submerged. Zwingli’s lasting work, Elenchus Contra Catabaptistas, is against those who dip or Immerse for Baptism. Belthazar Hubmeyer, on the mode of Baptism, writes in 1525, that Baptism is to cover the person with external water. Professor Howard Osgood, a Mennonite author, in 1666, published a treatise in favor of Baptism by Immersion. It should be remembered that the immature AnaBaptist of Zurich, advanced according to the light they had. Thus Conrad Grebel, who in 1525, baptized Wolfgang Uliman (by pouring), in but one month afterwards, with more light from the Scriptures, Baptized Ulimam by Immersion, in the Rhine. From then on, Conrad Grebel only Baptized by Immersion. As to the argument for effusion among the ancient Mennonites, derived from modern Mennonite authors, the words of Mosheim are worthy to be considered. “Many circumstances persuade me that the declarations and representations of things given by the modern Mennonites are not always worthy of credit”. – Quoted in Baptist Church Perpetuity, by Jarrel, pages 196-206. According to the Criswell study Bible, page 1800, it declares; the Protestant Reformation Reformers were PostMillennialist. The Amillenialist came from Origen through Catholicism. That at the time of the Reformation, AnaBaptist were the only ones for PreMillennialism. That many of the Church fathers from the initial centuries were also PreMillennialist. (This would have been prior to Origin). In regards to Pretribulationism, the quotes to follow are very important. It has been claimed by many CALVINIST, some who even call themselves Baptist, that Pretribulationism did not originate until the 1800’s. They say Margaret McDonald, in 1830 had a prophecy revealed to her. Many of these have offered rewards to any proof to the contrary. However, to this day, none of them are man enough to pay the Reward! 1. The central feature of Pretribulationism, the doctrine of Imminency, is, however a prominent feature of the doctrine of the early Church, according to Walvord in his book, The Rapture Question, page 50. 2. According to Moffit, it was the widespread Jewish belief, that some would be spared from the Tribulation Period to come. –See Commentary on Revelation 3:10, Expositor’s Greek Testament. 3. Diadache wrote in 120 A.D., “but be ye ready, for ye know not the hour in which our Lord cometh”, --See Ante-Nicene Fathers 7:382. 4. In the Constitutions of the Holy Apostles, Book 7, section 2, page 31, it states, “For what hour they think not, the Lord will come”. 5. Payne, although a postTribulationist, clearly affirmed that some of the early Church fathers held to the doctrine of Imminency. See Payne, The Imminent Appearing of Christ, pages 12-19. 6. Clement of Rome in the 1st Century wrote, “the Scriptures, the Holy Bible, also bear witness, saying, speedily will He come, and will not tarry. See—The First Epistle of Clement to the Corinthians, Chapter 23. Also See -- Clement's Second Epistle to the Corinthians! Scripture references being I Thessalonians 5:6 and Titus 2:13. 7. A Christian writing called the, “Shepherd of Hermas”, written in 110 A.D., taught a Pretribulational Rapture. See—Final Warning, page 317, written by Canadian Grant Jeffrey. 8. Ephraem the Syrian in 373 A.D., who was a major Theologian of the early Byzantine Eastern Church, wrote that the Bible taught a PreTribulational Rapture. See – Final Warning, page 306, by Grant Jeffrey. 9. Morgan Edwards in 1744 taught a PreTribulation Rapture. John Gill, the Founder of Brown University, ordained Morgan Edwards. Morgan Edwards has been called the first US Baptist Historian. See – the book, “The Day and the Hour, published by American Vision, foreword by Gary Demar, page 31. (If they have not bought up every copy they can find, and have not withdrawn the book from publication). 10. Dr John Gill, himself in 1748, in his Commentary on I Thessalonians 4:1, called the catching away the RAPTURE. 11. Peter Jerieu around 1687, taught a Rapture, with Christ going back to Heaven, before the second coming. (The Rapture Revelation, page 44, by Perry Stone). What are some of the historic marks of the AnaBaptist, that show what a true Church is? 3. A person joins a true Church by first being saved, and then by being Baptized (Immersion Only) into that Church, by proper authority. Therefore, there are many Churches, but a person can only belong to one local Church. (Matthew 28:18-20). 7. The true Church is Independent, with no Church higharchy, and not entangled with any government. (Matthew 18:15-18). The true Church is not Presbyterian in Government, as Anabaptist Churches Worldwide claims! 10. The true Churches weapons of warfare are not physical (Matthew 5:38-48; Matthew 26:52), but spiritual (2 Corinthians 10:4; Ephesians 6:10-19; and Hebrews 4:12). 12. A belief in the fundamentals of the AnaBaptist faith. Such as the Deity of Christ, the Trinity, Creationism, Verbal Plenary Inspiration, A literal PreMillennial return of Christ, Discipleship, and Eternal Security. (Notice what the Augustine (Lutheran) Confession of faith stated in 1580, “We condemn the AnaBaptists, who deny that those persons who have once been justified, can again lose the Holy Spirit”. See—Arminius Volume I, page 740). Who can deny that the AnaBaptist (later the Baptist) did not believe, and still do believe, in Eternal Security of the Saved! The following (4) points are added by Louis A. Turk, in a leaflet entitled Christ’s Church, published in 2003, by the Bible-Way Missionary Baptist Church, PO Box 13093, Hamilton, Ohio 45013. They are given to you here for your further consideration. I do strongly recommend the entire leaflet. However point 2, has been amended to comply with the Bible! 1. The true Churches government is a theocratic democracy (Acts 1:14-26; 6:1-8; 15:22-23; and 2 Corinthians 2:6): The Church is Sovereign, with Christ being the founder and only head (Matthew 18:18). The Church must be independent rejecting all forms of conventionism and ecumenicalism (2 Corinthians 6:17). 3. Sunday is the main day of assembly of the true Church (Mark 2:27-28; John 20:19; Acts 20:7; I Corinthians 16:1-2; Colossians 2:8-17; Hebrews 4:3-11; and Revelation 1:10). 4. The true Church is not charismatic. The miraculous ability to speak in foreign languages without study ended when the Bible was completed (I Corinthians 13:8-10); God no longer speaks to men through tongues, dreams or visions, now that the Bible is complete (Revelation 22:18); bodily healing is not part of the atonement, for if it was, Christians would never die physically. You might want to compare all 16 points with the false Churches listed below, and see why AnaBaptist Churches, and Biblical Baptist Churches, are really the only true Churches! This is not all of the Churches there are, but this list covers the major ones. All of these groups have their roots in Catholicism! Just what was John Calvin’s view of dealing with the AnaBaptist? “In order to set up an effective system, Calvin used the State to inflict more severe penalties. Such penalties proved to be much to severe, fifty-eight being executed and seventy-six exiled by 1546”. These numbers are supplied by the Presbyterians themselves, and only the Lord knows how many Saints of the Lord were really executed for their faith! See- Christianity Through The Centuries, by Cairns, page 338. What was some common thought among the AnaBaptist? “The AnaBaptist felt free to disobey the government whenever they needed to do so to follow Christ. And patriotism, for them, was a thing of the world”. – From, “The Secret of their Strength,” by Peter Hoover, page 55. The reformers (Protestant) believed that faith got handed down, like tradition, from generation to generation, and that it was imparted from parents to children in baptism. The AnaBaptist believed Faith was only an individual matter! See—The Secret of their Strength, by Peter Hoover, page 63. The AnaBaptist believed that suffering comes on us in three ways: -- The suffering of persecution, the suffering of temptation, and the suffering of sorrow or anxiety. From, “The Secret of their Strength,” page 99. “If you want to return to God, you need to return through the door from which Adam was driven out. To get in, you will have to leave your flesh, your own will, your lust, and your love behind, and you will need to submit to the law in your heart. You will need to follow the crying voice of John the Baptist and of Isaiah, preparing through the wilderness a way for the Lord, until the weaker gives way to the stronger – that is, until your spirit gives way to the Spirit of Christ. To do this, you must struggle and fight the flesh on every side. It will drive you to great distress and fear before the face of the Lord, until you become truly humble and think of yourself, as you ought to think. Then John will point you, in the innermost depth of your heart, to the Lamb of God, who takes upon Him the guilt of the world. You will see His salvation, and to you His strength shall be revealed”. In the 1500’s, a former Catholic Priest named Menno Simons, entered into a part of the Dutch AnaBaptist. It was not long, that he became a major leader in the movement (1536 onward). He would later take a part of the Dutch AnaBaptist, away from God’s true Churches, and form Mennonite Churches. These Churches followed after Menno’s doctrines, and even today the Mennonite Churches, still follow Menno’s teachings. It is therefore, very important, at this point, to take a close look at what this man believed, and what he led the Mennonites to believe. Menno Simons – Did not believe that Jesus got His flesh and blood from Mary, or that Christ had an ordinary body.